After decades of study with shamans, healers, Curenderos and Masters, Starr Fuentes has dedicated her life to helping others with the full unfolding of their purposes, paths and destinies. A master healer, spiritual teacher and intuitive Starr teaches more than 400 subjects, and has guided countless individuals down the path of healing, self-awareness and truth. She combines the use of modern psychological tools with ancient healing and shamanistic traditions, presenting a fountain of information in a teaching style that is animated, dynamic, and full of life. She has trained over one-hundred teachers who continue to spread her alternative healing wisdom throughout the United States, Europe, Israel, Brazil, Australia, Canada, and Asia. 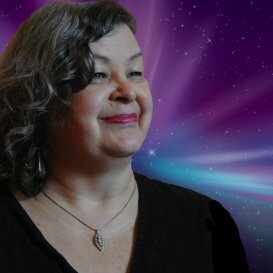 Join Starr each Wednesday at 2:00pm EST for ‘Starr Gazing’, a new program with Spiritual Connections radio. Click here to listen to previous broadcasts. The geodesic dome center has seating for up to 327 people, which provides us with the capability to facilitate large gatherings and educational workshops. Powerful healing from a practitioner with over 50 years of experience. Customized, One-on-one learning experiences with Starr. This a master at creating sacred space. This crystal contains a fire spiting dragon on it's face. This crystal is truly unique. It contains multiple shapes covering several configurations. Manifest the life you really want. Get Out of your own way FAST! I want to thank you so much for the healing you blessed me with yesterday. What a gift you are to us all. Your psychic surgery on me has retained its healing. You really dissolved those cysts in my breasts that were present even before puberty. I was amazed at how instantly the healing took place. Thank you for your good work. I can’t thank you enough for all your help, kindness and hospitality. I feel great and my bladder is functioning better and my overall condition feels stronger. Thank you from the nuclei of every cell in my body and from the essence of my being for helping me break the cancer chain in my lineage. I am ecstatic to report that my bone x-rays came out ‘stable” and my CT scan showed no new sites of disease and my MRI of the brain tumor out “normal”! Thank you Starr for your part in my healing. I have been a client of Starr’s for two years and have greatly benefited from her healing.My chronic fatigue fro systemic lupus has diminished significantly.I have returned to work for the first time in years.I am off my medication for the first time in 16 years.I recommend Starr to many friends and acquaintances. Starr is a gift to us all. Starr’s work has brought about enormous positive change in my life.It was Starr’s ability to assess my situation with complete clarity and her skill at clearing disruptive energies swiftly and completely that brought me overnight relief. I have great respect and the utmost regard for her work. You have helped me tremendously and I feel transformed! It’s quite astounding how quickly and directly you can pick up the essence and character of a person. I know I was totally healed by the energy healing taught by Starr. I know feel no pain physically or emotionally. I feel that I have taken control of my future instead of the past taking me into the future.